Most all individuals are searching for vehicles that are extremely fuel efficient. This becomes a challenge when the vehicle must also carry multiple passengers. While it is impossible to find a multi-passenger car that is as fuel efficient as most compact car, there are some that are much more efficient. There are several reasons that individuals require vehicles that will carry large numbers of passengers. Some may simply have big families and others may wish to save money during vacations. The 2014 Toyota Highlander Hybrid has been honored in several circles as the most fuel efficient vehicle with third row seating available on today’s market. This multi-passenger vehicle receives an estimated 28 MPG within the city. The initial investment to purchase it may be a bit steep; however, the fuel efficiency rivals that of most of its competition. The 2014 Nissan Pathfinder Hybrid is a newer model crossover that receives 27 MPG in the city and 25 MPG on the highway. This hybrid stands out from typical SUVs and minivans while providing incredible fuel efficiency. It offers 16 cubic feet of luggage storage and third row seating. Lowering the third row provides an additional 31 cubic feet of storage and lowering the second as well lends nearly 80 cubic feet. The 2014 Honda Odyssey has a 248hp, 3.5 liter, V6 engine that offers 27 MPG on the highway. It returns 18 miles per gallon within the city. Those who prefer the Touring Elite or Touring models will receive 28 MPG on the highway and 19 MPG in the city. These latter models have variable cylinder management system which provides a bit more power. It is in the top choice for fuel efficient, third row seating vehicles. The Odyssey lends room for up to eight passengers. 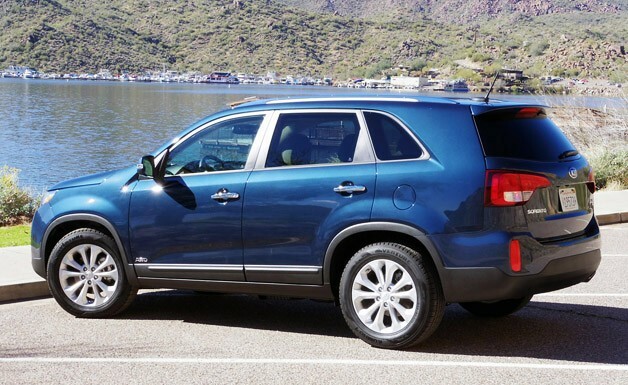 The 2014 KIA Sorento is classified as a midsized crossover vehicle and it provides third row seating for multiple passengers. This model KIA returns 26 MPG on the highway and 20 MPG within the city. It also provides 0 to 60 in about 8.5 seconds. The third row seating is not standard; however, it is offered at a nominal charge. It has a standard 191 hp, 2.4 liter engine or has an option of a 290 hp, 3.3 liter engine. The larger engine returns 18 miles per gallon in the city and 24 MPG on the highway. The 2014 Acura MDX rules the roost of luxury with seven passengers seating. This premium crossover provides up to over 90 cubic feet of cargo storage total. It has a 3.5 liter V6 engine that returns 28 MPG on the highway and 20 within the city. This Acura crossover is only available in a six speed automatic transmission. All vehicles on the market today offer a variety of safety features including state of the art air bags systems. Many also offer high tech gadgets for convenience as well as entertainment. It is possible in today’s world to find multi-passenger vehicles that are technologically savvy, safe, and very fuel efficient.